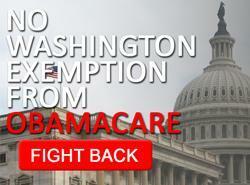 American Commitment is leading a coalition (of which I am a part of as the American Womens Alliance), of more than 30 national organizations, representing millions of American taxpayers who are members and supporters, in urging President Donald Trump to end the Obama-era’s illegal Congressional exemption from Obamacare. “It’s absolutely unacceptable that Americans are forced to endure skyrocketing premiums, burdensome taxes, and fewer health care options while members of Congress have falsely certified themselves as a small business to sidestep their own law,” said Phil Kerpen, president of American Commitment. Tell President Trump to End Congress’s Illegal Obamacare Exemption! After a meeting with Senate Democrats in March 2013, then-president Barack Obama personally committed to illegally exempt Congress from this provision of Obamacare. And he did. The House and Senate each filed a false declaration with the DC Health Benefit Exchange Authority claiming to have less than 50 employees – an indefensible fact that was never publicly disclosed.